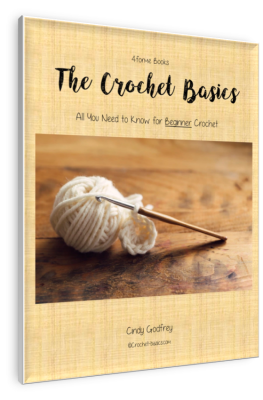 There are only a very few crochet supplies that you’ll need to get started. That’s one of the great things about crochet! However, you’ll find there are lots of nifty tools and gadgets out there. I’ll tell you about the basics and how they’ll help you the most. You’ll probably find that there’s some you love and some you never use. That’s ok. Everyone finds their own style and habits of doing things. I just want you to start off with all the information. Then you can pick and choose what works best for you. 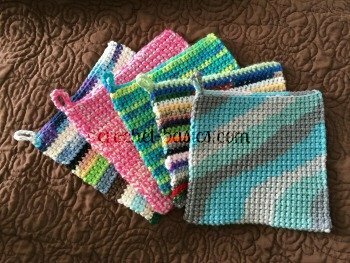 Remember crochet should fun and easy! These come in all kind of shapes. They almost all are for both knitting and crochet, too. The smallest hole your hook will slide through is the size of your hook. Scissors are a must for snipping yarn ends. I prefer smaller ones, but any size is fine. A thread cutter has a sharp blade that is enclosed in a metal, usually decorative, case. It can be used to slice through yarn easily. It’s especially helpful when you’re carrying your project from place to place – no sharp pointed scissors to worry about. They can also be worn as a pendant. These are generally small open rings that can easily be slid into stitches. They can be used to mark rounds, changes in pattens or to keep count on rows. You can use them anywhere or for anything that you need them for. Crochet Supplies Help . . .
Don’t think you have to run out and buy these. You can use paper slips, safety pins (without coils), scraps of yarn or thread or even an earring. These are blunt needles with large eyes and are used to weave in ends and sew pieces together. These are used to measure the gauge, the length of your project and to help when blocking a finished piece. These are used to help block your finished piece and are also used tat times when sewing pieces together. These are handy (but not completely necessary) when you're alternating a pattern by shape or size. It can also be used to create your own pattern or design and to keep track of your row count. These can be handy to keep track of your row count, especially if you struggle with recognizing your rows. 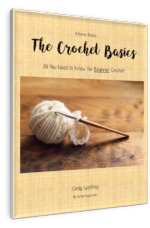 Leave Crochet Supplies and go to Reading Crochet Patterns.